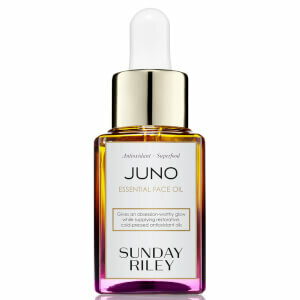 Juno Hydroactive Cellular Face Oil gives skin an obsession-worthy glow. This dry oil blend hydrates and vanishes, leaving skin velvety and smooth. This formula combines a patent-pending blend of lightweight, fast absorbing oils extremely high in natural Retinol, Omega-3, 6 and 9, essential amino acids, Vitamin C, UV shields, and natural anti-inflammatory agents for luminous skin. Argan Oil helps to nourish, hydrate and improve elasticity. Carrot Seed Oil stimulates circulation and improves tone. Marula Oil reduces redness and boosts hydration. Formula is chemical and preservative free. Can be used by all skin types including sensitive. Apply morning, night, or throughout the day as needed underneath Bionic Anti-Aging Cream, Cashmere SPF 30+ Sun Defense, or Skin Adrenaline Anti-Aging Concentrate. Black Cumin Seed Oil, Blackberry Seed Oil, Blueberry Seed Oil, Broccoli Seed Oil, Carrot Seed Oil, Chardonnay Grape Seed Oil, Cranberry Seed Oil, Marula Oil, Meadowfoam Seed Oil, Pomegranate Oil, Red Raspberry Seed Oil, Acai Fruit Oil, Vitamin E.
I tried this product at my Sister’s house and fell in love. She has beautiful skin and now I do too! I have had oily skin so thinking of adding a product with oil did not seem right until I did. Calmed my oil production down and my skin calmed down with a beautiful healthy glow. Purchasing my own products now!